The search found 9 results in 0.35 seconds. Peter G. Peterson Foundation writes an op-ed about debt solutions for POLITICO. The President’s budget for Fiscal Year 2012 contains spending and revenue proposals for the remainder of the current year, as well as the coming decade. What will America look like at mid-century? 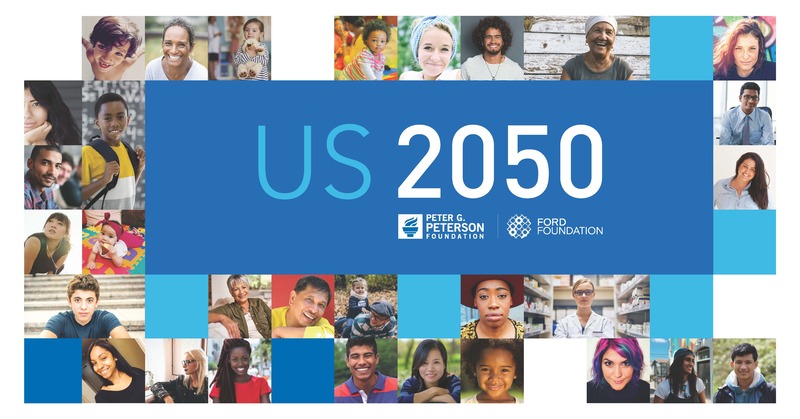 US 2050 will examine and analyze the multiple demographic, socioeconomic, and fiscal trends that will shape the nation in the decades ahead. Peterson Foundation Holds Fiscal Cliff Forum Today — Brings Together Lawmakers and Policy Experts to Discuss Solutions to Nation's Long-Term Fiscal Challenges. The Peter G. Peterson Foundation designed the Solutions Initiative, which asked six organizations representing the wide scope of American political thought to develop comprehensive plans for putting the country on a fiscally sustainable long-term path. Up to Us is a nationwide campus competition that provides an opportunity for students to build a movement to raise awareness and engagement on America's long-term fiscal and economic challenges. The Bipartisan Policy Center proposal is the first in a series of reports that will be released over the next several months that examines different ways to bring the budget back into balance and reduce the country’s mounting debt burden. In the legislative days remaining before the 113th Congress adjourns, there is much urgent work to be done to put the nation on a more sustainable and predictable path, now and in the future.